From quirky customs to cherished places, WPI observes many unique traditions that reflect the institution’s history and give community members opportunities to express themselves, bond together, and have fun. Here’s a rundown of some of WPI’s most time-honored and special traditions, many of which are run and managed by the Student Alumni Society. 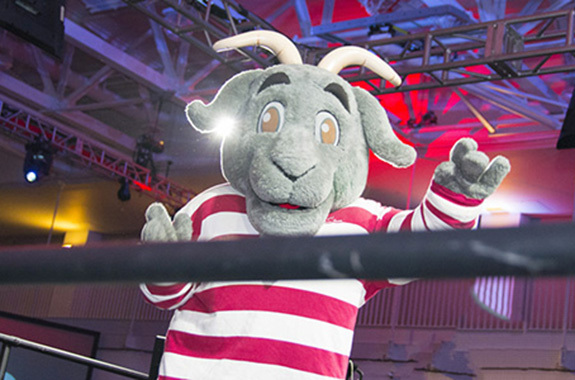 One of only two college goat mascots in the country, Gompei the goat was named for Gompei Kuwada, a member of the class of 1893 who served as WPI’s first goat keeper owing to his initials. The beloved mascot has a widespread presence on campus, including two bronze sculptures: the “Proud Goat” overlooking the WPI Quadrangle, often seen wearing a WPI sweater in the winter, and the “Charging Goat” greeting rival athletic teams outside the Sports and Recreation Center. WPI’s school colors are crimson and grey. The grey was selected by students who won a boat race in 1872 and the crimson was added shortly after. The two colors are reflected in the bark and leaves of the large eye-catching beech tree growing near WPI’s main entrance. 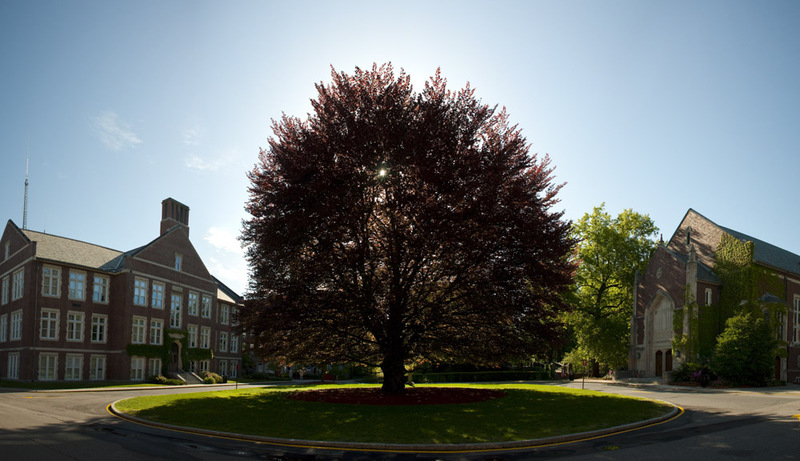 A gift from the Class of ‘43, the iconic beech tree near WPI’s main entrance and now stands over 100 feet tall. First-year students cross Earle Bridge as a symbolic entry into WPI and again, in the opposite direction, on Commencement. Created in 2001, the Adam El-Khishin Meditation Area offers a quiet space where students can remember those who’ve passed away. Higgins House is rumored to have a ghost, as visitors claim to hear noises near a hidden staircase where a former occupant died. Superstition holds that stepping on the seal at the center of the Quad will stop you from graduating on time. Homecoming: New and current students, faculty, staff, and alumni flock to campus on Homecoming weekend to watch and attend sports games, cheer on teams at the student rope-pull, and reminisce at alumni gatherings. Founders Day: Held on November 11, the anniversary of Boynton Hall’s dedication in 1868, Founders Day features reenactments of events from WPI’s history—as well as a visit from some real goats. Learn more about WPI's Founders. Winter Carnival: Students never know quite what to expect at Winter Carnival, a week-long festival that is entirely planned and run by student organizations and features activities ranging from comedy shows to spy games. Gompei’s Birthday: The WPI community celebrates Gompei’s birthday in late February with a winter-doldrums-busting party in Alden Memorial Hall. Traditions Day: Held on the second Thursday of April, Traditions Day educates the WPI community about the history and traditions of WPI and features events including a pie eating contest and Alma Mater sing-off. Quadfest: The week-long Quadfest marks the completion of the academic year as students prepare for finals. The festival follows a new theme each year and includes movies, outdoor games, and concerts with big-name bands. Each year, WPI’s freshman and sophomore classes compete in a series of contests with one goal in mind: to win the coveted Goat’s Head Trophy, a bronze statuette of Gompei. The rivalry kicks off with a rope-pull competition at Homecoming and plays out through special activities at major WPI events, including the Celebrity Squares game show, Eskimo Relay, Pennant Rush, Cage Ball, WPI-themed Jeopardy, and culminating Mystery Event at Quadfest. The WPI community also observes a variety of holidays both major and obscure. Groups including the Social Committee, Student Alumni Society, Chartwells Dining, and student organizations plan and host celebrations for holidays ranging from Valentine’s and St. Patrick’s Day to Pi Day, Harry Potter Day, and National Coffee Day. WPI’s brainy students test their knowledge and compete for prizes at weekly trivia nights held every Tuesday at the Goat’s Head restaurant. 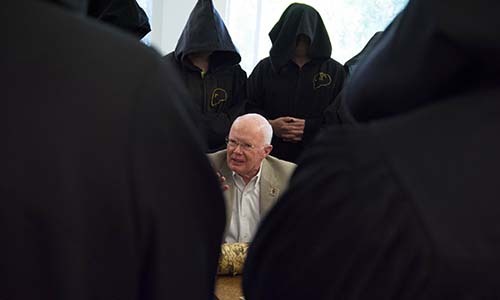 If you see a procession of black-hooded figures walking across campus early one morning, have no fear, it’s just the devoted members of Skull, WPI’s secret society. Founded in 1911 and shrouded in mystery, Skull is headquartered in the former Magnetics Laboratory and tasked with upholding WPI traditions. Its members are carefully, and clandestinely, selected and include students, faculty, staff, and alumni who have shown great dedication to WPI. From department and program initialisms to acronyms for buildings, student organizations, and offices, the WPI community has a long tradition of using abbreviations. Check out our handy guide, which will have you speaking like a native in no time.